The battle between encouraging innovation on the one hand and on the other, ensuring compliance with the necessary systems, processes and practices in place to govern activities, continues to rage within many organisations. But which side is winning and should we let it? There is a clear need for appropriate controls, checks, systems and processes to ensure that things are done in the safe, effective, efficient and lawful manner. However, this needs to be balanced with the need to encourage and drive innovation, challenge current processes and seek game changing ideas, concepts and approaches in order to keep ahead of competitors. Over the last ten years, with the ever growing demands of compliance and the need for organisations to provide increasing amounts of data to demonstrate that they have done what they said they have done, this balance has become out of kilter. Along with increasing compliance comes growth in non-customer facing areas of the organisation. More people need to be allocated to safety, quality, compliance, human resources and other roles that then create ripples within the organisation in the form of new forms, policies and systems with which others need to comply. This additional burden of compliance takes not only them but others away from creating opportunities, generating value and delivering outcomes to clients and customers. 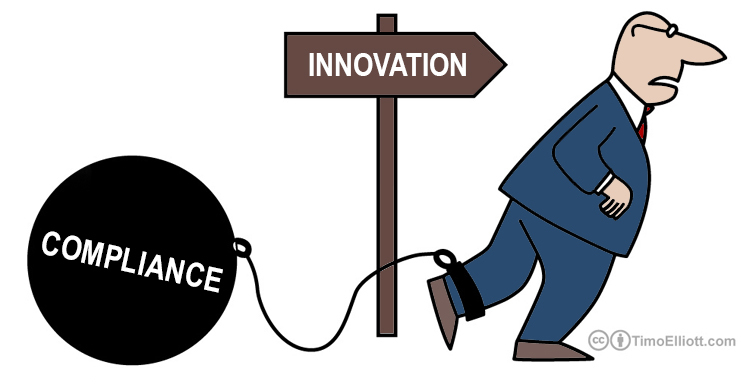 Some will argue that compliance is a necessary evil and that it does not stop innovation. Whilst this may well be true in larger organisations, many smaller ones find the burden of compliance costly and stifling and takes away valuable time and energy, that is desperately needed for them to remain competitive. At the end of the day, the question is not is compliance necessary but what can we do to ensure an optimum balance between innovation and compliance?